Now that you’ve figured out where you will be parking your tiny house, it’s time to start designing! I urge you to make your design decisions not based on what you would like your house to look like and working backward to functionality, but rather, addressing your functional needs and designing a house to suit them. Ideally, you will take your priorities and compare them to your budget. For example, it may behoove you to remember that affording a fully functioning utility set up is probably more important than skylights or roof decks! But of course, this will depend on your unique, individual needs. Do you need on- or off-grid utilities? Unsure about going off-grid? Check out our Off-Grid Guide! Designing your utility system will depend almost exclusively on your parking location, or lack thereof. Going off-grid means you will have no access to reliable, year round power and/or water sources. Including off-grid systems will cost more money than being on-grid and also take up a larger footprint inside your tiny house. Tanks and pumps will need somewhere to go and the best designs will make sure your systems don’t eat up your valuable living space, which is why it’s smart to know how you will want to set up your systems before you start designing. Will you be traveling full-time or moving your house often? If so, all of your utility systems should be contained in the house for easy maneuverability, similar to an RV. I recommend choosing a smaller size for the tiny life in the road, such as an 8x22' or smaller. This will allow you to tow your unit with ease and reduce the likelihood of needing a CDL or a vehicle with a high tow capacity. If you are hoping to park your tiny house in any or all locations, from RV parks to state campgrounds to boondocking, you might consider installing a variety of utility hookups, including the ability to be on- or off-grid depending on your parking site or trip length and destination. Number of occupants in your tiny house? The more people in your house, the greater amounts of sleeping spaces and clever storage solutions you will need. This will increase the amount of thoughtful details you or your builder will need to provide, which will increase the design and build time, as well as the cost of materials and overall weight of your home. It may limit the overall usability of the house. We get lots of potential tiny house clients who are looking for tiny vacation homes or tiny rental properties, but most of our clients are interested in living in their tiny house full time. A full-time tiny house will need to hold all your stuff and be sturdy enough for full time living in your climate - in New England, this means being totally winterized and reliable enough to keep you warm in freezing temperatures! Part-time tiny houses can get away with more minimal, modern aesthetics and less storage space. Full-time tiny houses will likely need every square inch to be considered in order to suit the client’s unique hobbies and belongings. For utilities, a part-time tiny house may be perfectly usable with abbreviated or rustic systems where full-time tiny house dwellers will likely need more robust systems that operate more like a traditional home. So now that you’ve gotten a handle how to prioritize your tiny house design, it’s time to decide whether you are going to DIY your tiny house or buy a tiny house. Both paths have a few options. If you choose to DIY, you can purchase plans and modify them based on your custom needs, hire Tiny House Crafters to draw framing and/or building plans for you, or buy a shell and finish the rest yourself. Or you can buy a move-in ready tiny house that is either customized and built by professionals like us or from the secondary market and sold as is. One good reason to buy a newly built, custom model from builders like us? You will be able to know exactly what is going on behind the walls, you will know that your utility systems will perfectly match your parking site, and that all your needs and wants are considered so the transition to the tiny life is as seamless and fun as possible! 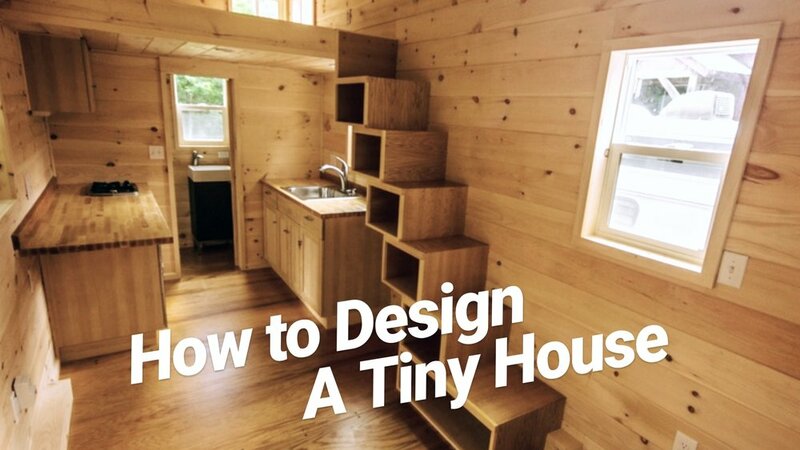 The Beginner’s Guide to Tiny House Design. At the end of the eBook, you will find THREE DETAILED WORKSHEETS that you can return to us for a FREE CUSTOM QUOTE and RENDER of your tiny house design! This eBook is for those who are interested in pursuing a tiny house build with Tiny House Crafters, those who are just starting their research and preliminary design work, or anyone who wants to learn more about tiny houses and tiny house design in general. If you’ve ever wanted to design or live in a tiny house, this is a must-have book for your collection! Draw to scale. First things first, you need a floor plan that speaks to you. Graph paper and pencil works just fine for this as a tiny house is easily planned out in one or two feet sections. One thing to remember is that the interior width of a tiny house is not a true eight feet. Once you take into consideration the legal road limits of 8.5' and then factor in roof overhangs and wall thicknesses, you will have more like 7.5' on the interior. This may not seem like a lot, but in a tiny house, every inch matters! PS - Our eBook has a to-scale floor plan worksheet for your sketching pleasure! Research building science for your climate. It's important to use the right building techniques and materials for your climate. For New England and other wet and cold climates, we focus on keeping our houses as dry as possible. At Tiny House Crafters, we make sure to use a rain screen between our siding and sheathing to help our houses dry out as well as spray foam insulation, which will prevent condensation from soaking into the stud bays. Using top-of-the-line building materials may be costly upfront, but it is one of the few ways you can truly make your tiny house investment last a lifetime. If you are having professionals build your home, make sure they know how to build for your climate! Get the right tools for the job. Building a tiny house on your own? Then be prepared to buy or borrow lots of tools! Parts of a tiny house build include framing, siding, roofing, insulating, electrical, propane, plumbing... the list goes on and on, all the way to detailed finish work! And each of these tasks will require special tools and knowledge to complete with confidence. For some, the right "tools" may also include custom building plans and/or the help of professionals!! Consult with us to determine the best building practices, design, and products for a truly successful build! Work with us to design custom framing and building plans so you can take on the whole project with confidence! Have us build you a sturdy and watertight shell that you can finish on the inside at your leisure! Start your build, finish it as much as time, skill, or budget allows, and then have us do the rest! ... however you want to go tiny, Tiny House Crafters can help you get there.